Using our state of the art facilities, Plastic Card Printing is able to perform high volume matching and attaching tasks in a minimal amount of time. We are able to match and attach cards, booklets and vouchers using both intelligent and blind attaching systems, digital gluing and folding techniques. 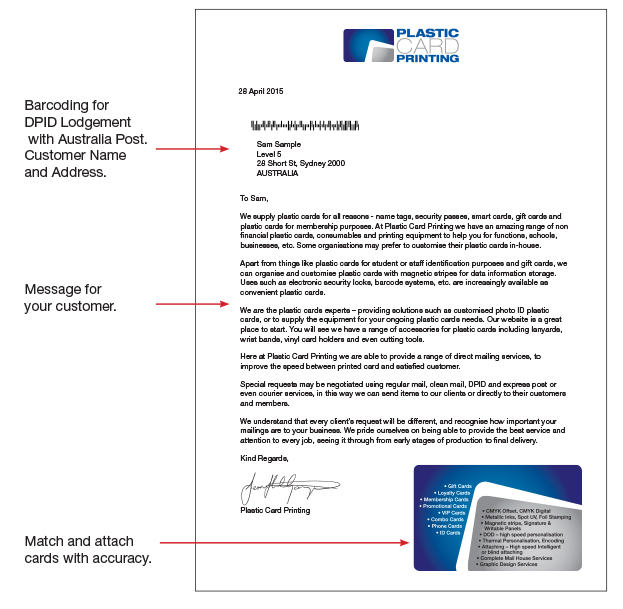 Our high speed attaching will make sure the correct card is attached to the right letter. Our cameras verify that your cards are matched and correctly attached to your letter. Our intelligent matching system is automated, using QR codes for maximum efficiency and accuracy. This allows your customer’s information to be precisely and securely matched with corresponding carriers or letterheads. Blind attachment tasks do not involve data matching, but perform at a high speed and accuracy to attach cards. Matching and attaching tasks are usually followed by a direct mail-out to customers, through our full range of mailing services. The result is an attractive and professional product for your business.